45% Off - All Wall Picture Frames including our Gold Picture Frames are on Sale NOW! Each of our Gold Picture Frames can include stretcher bars for a slight additional charge, simply request stretcher bars when you place your order. 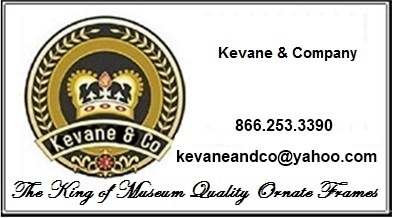 Kevane & Company has scowered the world to find the best possible value in Gold Picture Frames for Oil paintings, Watercolors or all of your artwork. ALL of our Gold Picture Frames are discounted 40% EVERY DAY OF THE YEAR! This makes Kevane and Company the best place on earth to find high quality gold picture frames for your oil paintings or all the rest of your art. Please be sure not to miss our entire Picture Frames Collection or the rest of our Decorative Home Accessories. At Kevane & Company you will find a full line of extraordinary gold picture frames. Each and every one of our gold picture frames featured here has been selected for its unique and superior quality and value. Please come back to this page often as we are ever expanding our selection of "gold picture frames". We offer a large assortment of superb, museum-quality Ornate Baroque style picture frames. All of which are available in a wide selection of standard sizes. You will find the mouldings of these gold frames intricately sculptured inluding very hard to find wide moulding widths up to 8"! We think that you will find our selection to be one of the most exciting collections of ready-made gold picture frames on the web. All of our Gold Picture Frames are measured from the INSIDE of the Picture Frame. This means that to derived the outside dimensions you must add two times the moulding width to each dimension. In other words, please order your Gold Picture Frames by size of the art that will go in your Frames. Also, please don't miss the rest of the items in our online shoppe - use the buttons to the left to negotiate our store. For your convenience we have also arranged our entire collection of Picture Frames and Ornate Frames in our section Frames By Size. 45% Off - All Wall Picture Frames including Gold Frames are on Sale NOW! 45% Off All Wall Picture Frames - On Sale from Now until Friday April 19, 2019! 50% Off - On Sale from Now until Friday April 19, 2019! This is complete selection of Large Picture Frames - 18 x 27 thru 48 x 72 - organized by size. Our Complete Selection of Picture Frames - 45% Off Now!